Whether you’re on an adventurous Safari or a summer road trip one of these new campers should keep you cozy and safe throughout your journey. I’m Glenn and here’s 10 new campers we think you should check out this year. Manufactured in Santa Barbara California the Hutte Hut is a lightweight camper designed with a detailed aerodynamic mobile structure. It features a solid aluminum spaceframe chassis, a glassy wooden finish and watertight interior. This is the perfect compact camper for people on short road trips. Make no mistake for a compact vehicle the lighting for this camper is one of its most impressive features as it’s designed with two windows. On each side a dangling LED bulb and a Sun diffusing canopy to give a brightened camp hut feel. With two sets of double doors opening on each side the Hutte Hut provides an expansive ventilated camper. Perfect for those who want to get closer to nature. 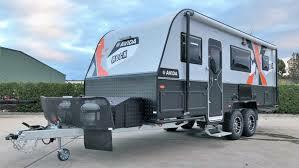 This camper is towable by most cars. Due to its extreme light weight pricing on this one starts out at sixty three thousand nine hundred dollars. At first glance the Kimbo 6C looks like a bullion van style camper mounted on a medium-sized truck to serve as a makeshift motorhome. However this perfect adventurers getaway is anything but makeshift. Weighing approximately 930 pounds the Kimbo 6C is an aluminum riveted shell with a brushed fabric interior. 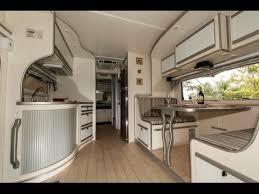 This 6 foot camper features two couches for seating, a loft bed, a fitted kitchen and a foldable shower unit. All appliances on this vehicle are powered by any of the three available power options of solar, propane or an external power connection. 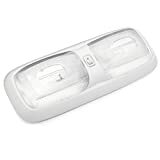 There is also a standard three-speed roof vent fan with a skylight as well as six double pane insulated windows to keep you comfortable at all times. Prices will run you anywhere from 15,000 to $26,000 depending on the included options. The Bimobile EX 412 offers a perfect mix of off-road adventures and a comfortable living space boasting a standard four-wheel drive, 4×4 suspension and 24 forward gears. This motorhome surmounts uneven roads and hilly terrains without a wheel leaving the ground. It is robust, balanced and offers a large living space that isn’t noticeable from its external sturdy build. The interior features a fixed double bed, a fitted kitchen, a shower and a nicely constructed dinette. This converts to a secondary sleeping area if needed. For such a complete vehicle you wouldn’t go wrong if you chose to temporarily live in this motorhome. Current pricing on this one starts out around one hundred ninety six thousand. Made by South African company Echo 4×4. The Kavango Extreme is a hybrid off-road camper carefully designed for the safari experience. Built with a solid full-length galvanized chassis, a four-wheel drive suspension and a monocoque low-profile fiberglass shell. Belonging to a class of long-lasting recreational vehicles it uses well treated wooden components. Quality automobile seals and double action cam lock systems prevent dust and rain from infiltrating or corroding the camper. The pop-top roof and built-in tent offer enough space to cover a slide-out kitchen, a large fridge and a slide-out exterior bath. On the inside the camper features two queen-size beds, a tent bed floor that opens and expands with the help of gas struts and a dinette which can be converted into a second bed. Offering an inspired luxury interior and weighing just under 1700 pounds the 14-foot Falcon F-Lite is the true definition of a modern caravan. It has a sleek build that’s made even more attractive by a matte paint scheme and contrasting decals this vehicle will definitely turn heads. The interior boasts even more with luxury living space. This features a convertible dinette, a standard kitchen, a deluxe wardrobe a full bathroom and large pass-through storage. It offers expansive external views through slider windows on each side as well as a large 48 inch slider window at the rear. Pricing on this one will run you a cool fifteen thousand dollars. The 2019 Optima deluxe T65 GE is one of ten motorhome models by Hobby with an elegant exterior design and high equipment package. This motorhome is built to convey luxury. It features two foldable individual seats, a drop-down bed with an additional queen-size bed and a corner kitchen over the top. There are three roof lights in the living area, sleeping area and washroom. To keep the van illuminated all throughout the day hot and cold water lines are supplied to the bathroom and the kitchen which houses a 140 litres slim tower refrigerator, a revolving cupboard and all-around overhead shelving. Owning one of these will currently set you back about $85,000. Camper and motorhome accessories on Amazon here. As the name suggests the 17-foot Titanium off-road camper will have you conquering uncharted territories in style. With a rugged chassis design, double tires on each side and a dry weight of 4,000 pounds it’s perfect for remote camping adventures. True to this it features 3 200 watt solar panels on the roof, providing sufficient power for everything. Ideally designed to fit a couple the off-road camper includes a two-person dinette with leather seating, a queen-size mattress and external shower facilities. The company also provides custom builds which include a variety of layouts. Prices for this one start out at 98 thousand dollars.